↑ "Muslims worldwide start to observe Ramadan". The Global Times Online. 2012. http://www.globaltimes.cn/content/722486.shtml। আহৰণ কৰা হৈছে: 28 July 2012. ↑ "The Muslim World Observes Ramadan". Power Text Solutions. 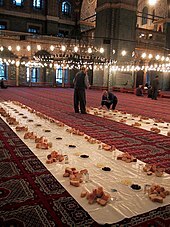 2012. http://newsfeedresearcher.com/data/articles_w30_3/ramadan-muslims-fasting.html। আহৰণ কৰা হৈছে: 28 July 2012. ↑ "Schools - Religions". BBC. http://www.bbc.co.uk/schools/religion/islam/ramadan.shtml। আহৰণ কৰা হৈছে: 2012-07-25.